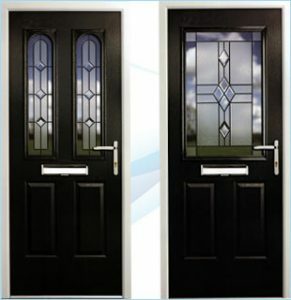 When vinyl replacement doors were first introduced the only colour you could get was white, not only that, but the vinyl (uPVC) would tend to discolour, the dirt would get ingrained and so they would start to look ‘past their sell by date’ after only a few years. Fortunately, this has all changed, new manufacturing processes allow for fully bonded coloured finishes to be applied to the windows – these finishes don’t peel, fade or crack. Options for giving a door the look & texture of real wood are becoming very popular, the wood-grain effect is really striking and can make a huge difference to how the windows look – especially useful if you want to have a little extra ‘character’ for your home. Finishes, can probably be split into 2 main categories, wood effect & plain colours. Plain colours are really self-explanatory, such as white, brown, black etc. – wood effect is where the finish mimics the look of light oak, rosewood, ash, hard wood etc. Both of these can be combined with a wood-grain surface.